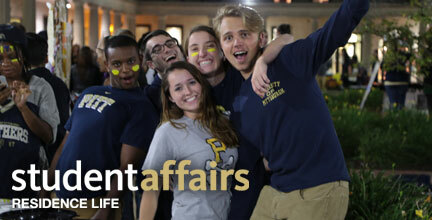 There are 17 first-year Living Learning Communities (LLCs) that have been intentionally designed to help students transition to the University of Pittsburgh while gaining connections within the campus and Pittsburgh communities. Whether it’s an academic-based community such as Business or Engineering, or a interest-based community such as Emerging Leaders or Service to Others, our first-year LLCs provide instant connections to like-minded peers and University staff and faculty. In addition, first-year students who live in our LLCs have higher average GPAs; attempt and complete more credit hours and; have higher retention than their non-LLC peers! Check out each of our first-year LLCs below to find out which one is right for you! The Appreciation of the Arts Living Learning Community (LLC) offers a unique residential experience for artists, performers, and those who appreciate the arts. This community, in partnership with the Office of Pitt Arts, allows you to tap into your creativity, to create lasting masterpieces with your peers, and to showcase your strengths. In the Appreciation of the Arts LLC, you’ll be instantly connected with peers who share similar artistic aspirations and interests. Moreover, you will have the opportunity to experience a wide range of arts-related programming with your floor mates. The possibilities with this community are limited only by your creativity! Immerse yourself in a Living Learning Community (LLC) packed with events, activities and fun all in the Spanish and Portuguese skills. The Casa Cultural LLC, in partnership with the University Center for International Studies and the Center for Latin American Studies, allows students from all walks of life to come together to practice their language skills and learn about the culture, history and social aspects of Latin America and the Caribbean. Students are immersed in these languages through daily spontaneous interaction with their neighbors, as well as through organized activities such as movie nights, dinners, guest lectures, concerts and excursions. Students residing in the Casa Cultural LLC will be required to be registered in a Spanish course. Students should consult with their academic advisor or LLC Liaison for more information. Registrate hoy!! The Emerging Leaders Living Learning Community (LLC), in conjunction with the Office of Cross Cultural & Leadership Development, provides an exemplary opportunity for you to develop, hone, and sharpen your leadership skills and abilities with like-minded students. Today, more than ever, leadership skills are increasingly important in our global society. Employers and internship providers regard leadership skills as crucial. The Emerging Leaders LLC allows you to jumpstart your college leadership by living with other students who are interested in being leaders on campus. You will complete the Emerging Leaders program, a ten-week leadership certificate program, with members of your floor and network with high-profile student leaders on campus. Overall, Emerging Leaders provides the opportunity to connect with other ambitious students who share a passion for leadership. Students residing in the Emerging Leaders Living Learning Community will be required to register for and complete the Emerging Leaders program through the Office of Cross Cultural & Leadership Development during the fall term. This is a ten-week leadership certificate program. Students will complete the course with members of their floors. There will be no cost to complete Emerging Leaders for students residing in this community. Students will also have the option of completing Leadership in Action in the spring term with members of their floor community. Living in the Engineering Living Learning Community (LLC) gives you the chance to truly live and learn with your classmates. By participating in the Engineering LLC, you’ll have the opportunity to live, study, take classes, and socialize with members of your floor and building. Resident Assistants are sophomore and junior Engineering students who serve as guides and peer mentors. Swanson School of Engineering faculty and staff are highly focused on providing you with resources to make your first year in the Swanson School of Engineering successful. Residence hall programs are tailored to meet the needs and demands of Engineering students. Most important, this experience provides instant connection to and high contact with other Engineering students. In partnership with the Gender, Sexuality, and Women’s Studies (GSWS) Program, this LLC provides students with gender neutral housing as well as the opportunity to participate in both programming and a one-credit course on LGBTQIA+ communities. Students in this community will share a floor section and bathroom with students of all gender-identities and have a resident assistant (RA) who is focused on supporting an inclusive community. During the fall semester of their first year in the LLC, students will be required to enroll in GSWS0002: LGBTQIA+ Communities. This one-credit course will focus on ways in which LGBTQIA+ communities are and have been constructed. There will be two components: reading and discussion on the history of such communities, mostly in recent US culture, and site visits and guest speakers from Pittsburgh communities. The course will be reserved for students in the Gender and Sexuality Living Learning Community and will be graded satisfactory or no credit. After their first year in the LLC, students choosing to return to the LLC would have the option of enrolling in the course again or serving as peer mentors to new members of the LLC. In addition to taking the class, the LLC students will be offered general social, academic, wellness, diversity, etc. programming, but more importantly will be offered programming connected to the focus of the LLC. Students will connect with the Rainbow Alliance through orientation events and programming throughout the academic year. Additionally, the RA will work with the resident director (RD), Cross Cultural and Leadership Development (CCLD) staff and GSWS faculty to implement LLC specific programming including, lectures, film screenings, creative projects, colloquia, and reading groups. The Global Village Living Learning Community (LLC), in conjunction with the Office of Cross Cultural & Leadership Development and the University Center for International Studies, is a special opportunity for first-year students who have a genuine interest in an international perspective. Living with other like-minded students, you’ll participate in programs that explore critical global issues by blending perspectives from popular culture, historical contexts, and current events. Make friends with students who have similar interests through informal interaction and special programs. The Global Village LLC will expand your Pitt journey and provide you with countless benefits in becoming a globally-educated citizen. Are you looking for an enhanced opportunity that will make you more competitive in the medical school application process? The Health Sciences Living Learning Community (LLC), in partnership with the School of Health Sciences, brings together students who are interested in a variety of health sciences. From pre-medicine to pre-pharmacy and rehabilitation sciences, the Health Sciences LLC enables you to live, study, and socialize with students in health-related fields. In addition to forming close bonds with other students on your floor, you’ll also have the chance to build a relationship with your upperclass Resident Assistant who is also pursuing the health sciences. Participation in this community will leave a lasting imprint on your collegiate experience and help you learn more about igniting your passion for the health sciences. As a member of the Honors LLC you will join a diverse group of students who hail from every corner of the globe, represent virtually every major, and have a wide array of interests. These students share a commitment to academic excellence, involvement, and responsible living. This is a student-driven environment, where mature and creative students learn from, and challenge one another. Join the Innovation and Entrepreneurship LLC and build the economy of the future one idea, one new venture at a time! A partnership between Pitt’s Schools of Business, Engineering, Arts & Sciences, and the Innovation Institute, this LLC will teach you how to make an immediate impact on society through explorative workshops and special projects. This community cultivates innovative thinkers, both aspiring entrepreneurs and those driving innovation within existing organizations. Tailored to music majors, but open to all, this LLC taps into your passion for music and exposes you to a dynamic range of musical genres. If you're a music major, you will receive preparation for a productive career as a teacher, performer, composer, scholar, and citizen. Music LLC residents attend musical performances on and off campus and explore local music venues. The Nursing LLC affords you the opportunity to live in an engaging and supportive academic and social environment. Conveniently located in Lothrop Hall, this LLC is connected to the School of Nursing and adjacent to the University of Pittsburgh Medical Center (UPMC). Participating in the LLC gives you a chance to be part of a community of peers, faculty and staff who share similar academic interests. By living together in this supportive environment, you can form study groups, share interests, and explore common academic aspirations which will augment the regular academic program and provide enriching experiences not normally found in the conventional classroom or residence hall. The Resident Assistant (RA), an upperclass Nursing student, is there to help you achieve your potential as you begin your first year of undergraduate academic success! In collaboration with a faculty advisor, students participating in the LLC share input about the activities they want to participate in that will enrich their nursing and living experience. As a resident of the Nursing LLC, you will participate in Emerging Leaders program, which has been designed to complement your classroom and student life. There will be no cost to complete Emerging Leaders for students residing in this community. Experience the outdoor excitement that the Pittsburgh area has to offer. As an LLC member, you will participate in a variety of outdoor trips through Intramurals and Recreation, such as hiking, kayaking, and whitewater rafting. In addition, you will automatically be enrolled in the Pitt Outdoors Club and have the opportunity to participate in their specialized programming. Get a jump on your business education by making keen connections with faculty, staff, fellow students, and successful members of the Pittsburgh business community. This LLC will expose you to area companies and internships, and shed light on how these organizations are working to improve the area. For even more information about the Pitt Business LLC visit their website! The ROTC Living Learning Community (LLC), in partnership with Pitt’s Three Rivers Battalion, provides an opportunity for cadets to live together, train together, and learn together. This unique experience allows you to sharpen your leadership skills through specialized programming and to connect with fellow cadets through bonding events. The ROTC LLC promotes camaraderie among you and your fellow cadets. Do you have a passion for helping others through community service and philanthropic events? The Service to Others Living Learning Community (LLC), in partnership with the Office of PittServes, allows you to live with other students who are interested in community service. With members of your floor, you will plan, design, and participate in community service projects in the Pittsburgh area. Form close relationships with members of your floor, as you enjoy activities like movie nights and pizza parties. This community provides you with an ideal opportunity to share your passion for helping others. In partnership with the Gender, Sexuality, and Women’s Studies Program, this LLC extends an enlightened view on leadership, activism, and community building. Discuss and examine your experiences, achievements, and position as women in higher education and society. Women in this LLC are required to register for a one-credit seminar in the Fall semester.